Click these thumbnails for enlarged views of the Votives in Suspension proposal. This design creates two underground indoor spaces, one for each of the twin towers. The rooms will be dimly lit by votive candles - one for each victim of the terrorist attacks - that hang suspended over a reflecting pool. The height of each candle will be determined by the age of the victim. The names of each victim will be also be listed in alphabetical order on walls of the space. An underground passageway will connect the two rooms and provide access to the bedrock where unidentified remains were found. 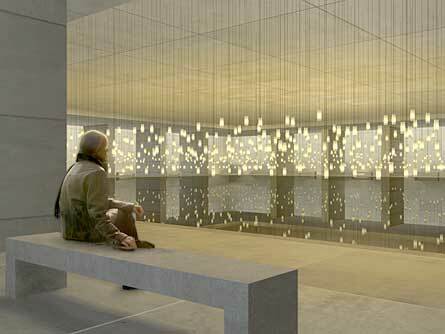 Most of the space above ground will be open space and provide an area of memorial services. Designers Norman Lee and Michael Lewis both work as museum exhibit designers in Houston, Texas. "In their absence, the World Trade Center Towers have attained a greater degree of symbolic significance, their meaning instantaneously transformed on September 11, 2001. As monumental buildings, they were symbols of American capitalism, as voids, they now represent a concept of loss unparalleled in both scale and complexity. Our proposal for the WTC memorial aims to transform the towers' footprints into dual sanctuary spaces that resonate profoundly with a sense of both individual and collective loss. The memorial sanctuaries will be set into the earth and semi-enclosed from the outside. Only narrow gaps that outline each footprint will allow sunlight to penetrate into these sacred areas. Austere and minimal, the exteriors will give no indication of their interior space. From street level, the sanctuaries' monolithic expanses will invite contemplation and suggest absence. Once on the memorial grounds, the sanctuaries will only be made visible to visitors by long parapet walls that surround the footprints of the original towers. Most of this area will be kept as green park space providing a versatile venue for memorial ceremonies. Visitors will also be visually drawn to the exposed slurry walls on the western edge of the site as well as the Liberty Wall located on the southern side. The Liberty Wall will be engraved with monumental text that provides a didactic historical timeline of the World Trade Center site. A large part of this story will focus on the heroic efforts of brave rescue workers who worked tirelessly, many of who made the ultimate sacrifice, to save lives on September 11th. Visitors will descend down a stairway or lift system into each sanctuary, emerging into a darkened, serene environment. Here they will witness an expansive field of votive lights suspended in mid-air creating a sublimely beautiful downpour of loss. The votives, each representing a victim of the terrorist attacks, hang down on cables from the sanctuary ceiling just above a reflecting pool. The cables will function as capillaries that channel liquid fuel into the votives to sustain the symbolic flames. The age of each victim is used to determine the height of the suspended votives creating an irregular field of light that both breaks apart into fragments and coalesces as an entirety. This reinforces the memorial mission to convey both the overall magnitude of loss and pay tribute to individual lives. As a part of the memorial's creation, victims' families and friends will be invited to light the votives that represent their lost loved ones. Each flame, therefore, will be created by an individual act of remembrance. The name of each victim will be listed horizontally in alphabetical order on the parapet walls that define and encompass each sanctuary space. The procession of names will begin in the sanctuary devoted to the North Tower, where the first plane hit, and conclude in the sanctuary dedicated to the South Tower. A somber underground passageway will connect these two sanctuaries as well as provide access to a burial space located at bedrock for the unidentified remains of victims."